I'm having some issues with cursor laggy/jumping when I use my Wiimote (RVL-CNT-01-TR) in Dolphin. When I spin my wiimote in a circle it's almost like it's missing transmission and records more of a square on screen. If I move it back and forth (left & right) it's not fluid and jumps across the screen slightly. Every so often, it acts normal for a split second - I've uploaded a video below (youtube link) to help describe my problem. 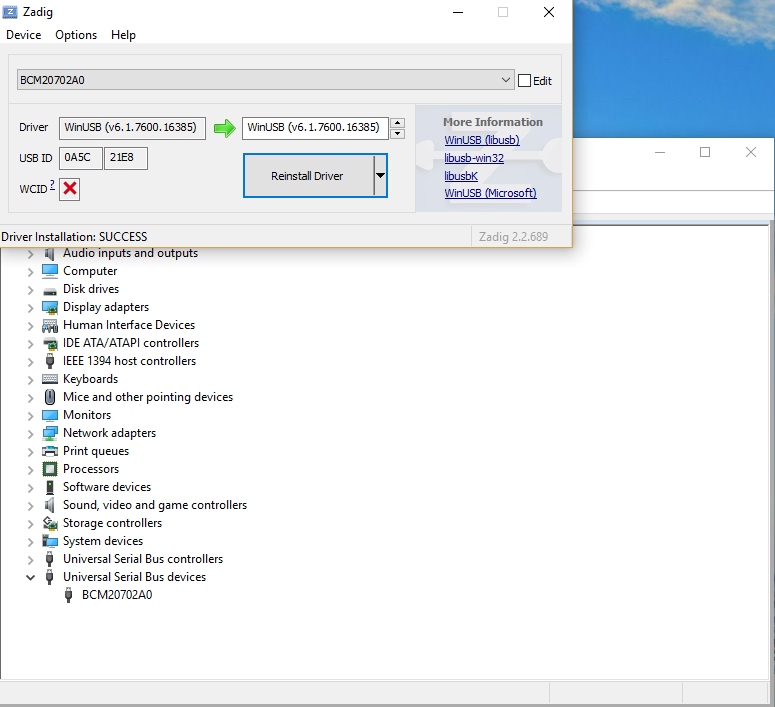 I'm on Windows 10 and using a Kinivo BT USB adapter (Broadcom BCM20702 chipset). My machine specs are very good, I don't get any video lag at all. When I try the same sensor bar and wiimote on a laptop with internal bluetooth, the motion is perfectly fluid so I've ruled out the wiimote, sensor bar, external lighting, etc. I went as far as trying a second bluetooth adapter with good Amazon reviews (where it was mentioned working fine with Dolphin) with the same problem, come to find out it uses the same Broadcom BCM20702 chipset though. When I tried the exact same sensor and wiimote on a laptop with internal bluetooth the cursor is smooth as butter. Also, when I had a Windows 7 machine with Toshiba Bluetooth stacks installed I don't recall having this issue with the same exact adapter? I downloaded the latest development build and attempted Bluetooth passthrough. I had to force my adapter via inputting VID & PID into the dolphin config file, but Dolphin still hangs at scanning for wiimotes. I tried pressing the sync button both before opening and game and syncing as well as after the game was loaded. My adapter (Kinivo BTD-400) has been tested good according to the bluetooth passthrough wiki. Any ideas? What do you mean by "hangs at scanning"? Does it really hang, or is it just not seeing your Wii Remote? (12-31-2016, 03:34 AM)leolam Wrote: What do you mean by "hangs at scanning"? Does it really hang, or is it just not seeing your Wii Remote? It doesn't physically hang, however it never finds a Wii remote or pairs. However it looks "Continuous Scanning" was the culprit here. After unchecking cont. scanning - the cursor works perfect via the regular method (non bt-passthrough). I am posting back in hopes that this will help someone else as well. Thank you for your help leolamn.